1.) Every night before bed, my pillow get’s a spritz of this, then I brush my teeth and when I come back into the room, the waft of lavender has permeated my pillow (and a little of Himself’s pillow too) and I swear it puts me to snooze in half the time. 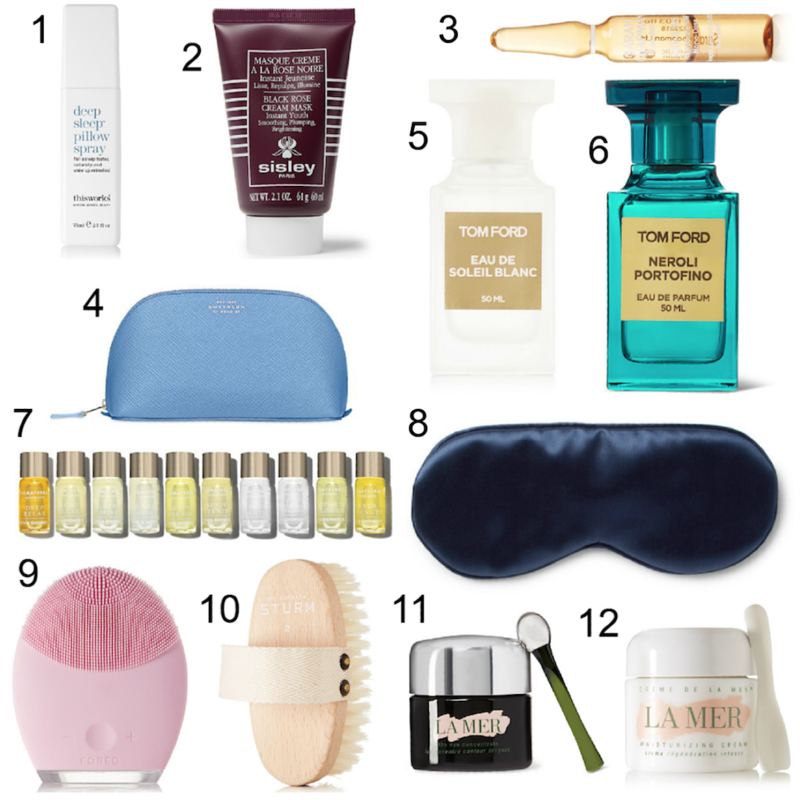 It’s so relaxing – and there’s little better for your skin than a genuinely great nights sleep! 3.) I have not personally had the pleasure of trying out this set (yet!) – but I can tell you that before leaving London, Sarah Chapman’s was THE place for facials and I was lucky enough to go there twice with insanely good results after 90mins with them, so anything Sarah makes, I going to want to try! This bundle of individually portioned 10 day treatments sounds properly lush and would be a “wowza” gift to give to the beauty fanatic in your life! 4.) Whether you’re male or female, alien or “other”, you need somewhere to put your stuff! This cosmetics/wash bag from Smythsons is beautiful and simplistic and would be a gorgeous addition to anyone’s bathroom/travel bag! 5.) This is my absolute favourite scent from Tom Ford for women – simply divine – and who doesn’t love to be gifted a posh perfume at Christmas!?! 8.) I bought the pink version of this eye mask before we travelled to the states at the beginning of the year and now I wouldn’t be without it for ANY travel at all. It’s silk which means it’s wonderful against your skin and doesn’t dry it out like cotton eye mask will, so this is a great way to look after your skin whilst still getting some shut eye! 9.) I really want to try one of these, the Luna cleanser is meant to be the be all and end all of cleaner tools and I have it on good authority that it is a TRAVESTY that I don’t own one – so if your friend doesn’t, or you don’t – pop it on your Santa list. 10.) Body brushing has become a big deal – it’s an ancient act and encourages new cell skin renewal improving blood circulation and lymphatic drainage, it’s meant to be the bees knees! To do this, you need a body brush and this is a great one. 11.) This eye cream is un-REAL!! You need it, your Mom needs it, your person needs it, your Grandad needs it, everyone needs this cream in their life – right now! I hope you have a super weekend, see you next week for more. Happy shopping to one and to all!! So pleased to hear this Ellie, glad to be of help!! Happy Shopping!! I’ve never heard of sleep pillow sprays – but sounds like something I could really use. Loads of other fab products here, will definitely come in handy for Christmas shopping! Thanks so much babe! Enjoy the sunshine – don’t forget suncream!! 🙂 Meanwhile, I’ll be over here with my thick socks, scarf and wooly hat!! Have you smelled Tom Ford’s Tobacco and Oud? It’s divine. So sultry and long lasting. Totally inappropriate for work in a hospital, where unfortunately I spend the majority of my time. I haven’t actually Cynthia, I must check it out the next time I pass a Tom Ford counter, sounds gorgeous, thanks for telling me about it! Why not keep a bottle for yourself to wear on special occasions when you’re not in the hospital? Anything Tom Ford or La Mer is a sure fire winner for me! Yes Danielle, I totally agree!! Yes Tara! I totally agree, if we don’t pack it to use when we’re away, I do get just that little bit sulky haha!! Thanks Kate – yeah, they look super! Fantastic guide!! Thanks for the preview. Definitely be marking these items for sure. Great to hear Bethany – happy shopping! Thanks Gabrielle – I have no doubt he will – my fella loves it!